If anyone needed to get in the mood for Plan-B Theatre’s exquisitely creepy rendition of three Grimm Brothers tales prior to the live broadcast on KUER-FM’s RadioWest show, the news lead-in at the top of the hour did the trick. In less than four minutes, audience members in the downtown Jeanne Wagner Theatre heard news about cyclones, hurricanes, a blizzard in Nepal, the spreading Ebola crisis and Saudi Arabia’s decision (note: a US ally) to crucify a reformist Shiite cleric. However, once Oma, the ancient grandmother, begins telling the story of Rapunzel, which opens with her mother, “the stupid girl,” who was carrying the unborn child that would become a clueless virgin beauty with famous long locks, the audience is transported immediately back to the time when fairy tales were hardly saccharine fantasies and sweet romance. In its ninth Radio Hour episode, which opened Plan-B’s 24th season, there was perfection at every turn in a production directed by Cheryl Ann Cluff. The five-member cast, which also was responsible for all of the character noises and effects, crackled with tremendous energy in doing the one take that is recorded for posterity. 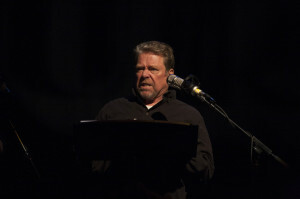 The cast included one actor who has performed in every Radio Hour play (Jay Perry who astounds in his versatility to assume multiple roles at a moment’s notice) and another who was taking her first turn in a live radio play (Colleen Baum who seemed as equally at home with the genre as Perry). 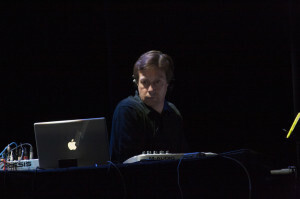 David Evanoff’s music was, at various times, chilling, cheeky or moody, especially in the accompaniment for ‘The Juniper Tree,’ the middle story, which emphasized why Plan-B’s talent is driving the thrilling ascendancy that defines one of the nation’s most adventurous small theater companies. 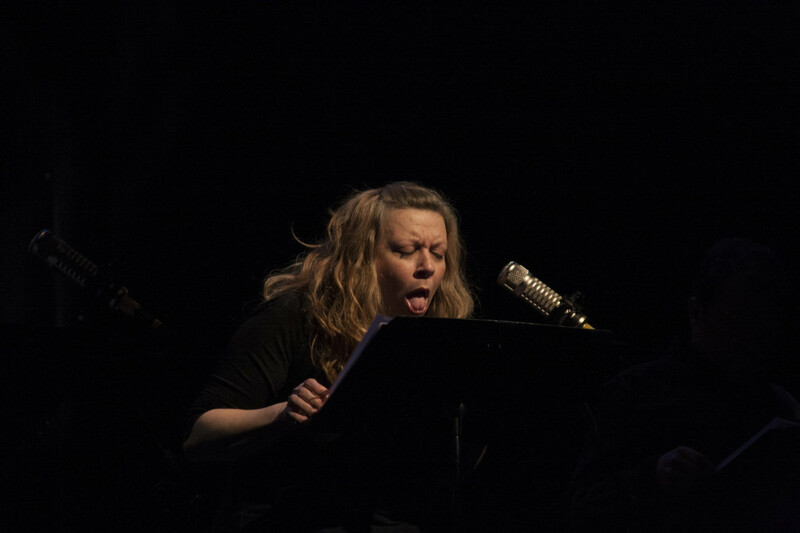 The cast thoroughly inhabited Matthew Ivan Bennett’s script, which was as genius as an adaptation of classic stories could be, balancing elegantly the authentic nature of ancient folktales with the occasional brief leaps into contemporary references. Actor Jay Perry in ‘Radio Hour Episode 9: Grimm.’ Photo: Rick Pollock. 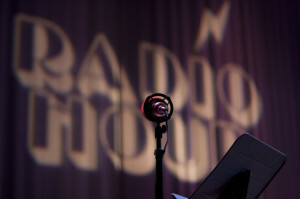 Actor Teresa Sanderson in ‘Radio Hour Episode 9: Grimm.” Photo: Rick Pollock. In an age where everyone seems to have rediscovered the compelling art of storytelling and narrative, Plan-B’s ‘Radio Hour: Episode 9: Grimm’ reminds where this art is really rooted. As mentioned in the earlier preview, Bennett casts the Grimm stories as raw and unfiltered as possible that amplify the remarkable storytelling folk tradition covering many centuries. All of the literary cleansing that has taken place for the sake of popularizing the folktales since Jacob and Wilhelm Grimm published them 200 years ago has clouded the reader’s capacity to see what these ancient stories were really communicating. Bennett’s adaptation and the cast’s consistently on-point rendition of it help to restore our capacity to see the tales as constructive ways for making sense of a world that, unfortunately, is as cruel, feral and as negative as it might seem in the realm of fantasy. 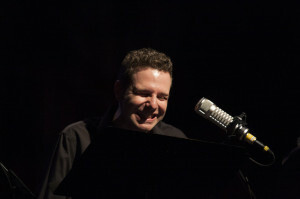 Jason Tatom in ‘Radio Hour Episode 9: Grimm.’ Photo: Rick Pollock. Actor Colleen Baum ‘Radio Hour Episode 9: Grimm.’ Photo: Rick Pollock. Likewise, Teresa Sanderson, who assumes five roles at various points in the production, possesses fully the literary specter of the venerable Oma, who narrates the story in a voice that has been forever rasped and chafed by alcohol and the chilly winds of many ages. There is such crisp relishing, as she relates what happens to Rapunzel’s suitor, Prince Meinhard, who is 12 like the young girl, and is discovered by the fairy as the one who gave Rapunzel the “special hug” to impregnate her: “He vandters into forest, eatingk grass, no longer a prince, but now a beggar who sleeps next to goats. Ten years he vandters, until finally he shuffles, tiredt, to a crude, lean-to shelter of bones in ze vilderness.” Meinhard, of course, is reunited with Rapunzel and her two children, Meinhard junior and Meinhardette. 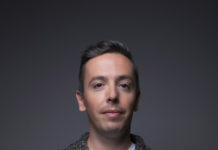 Jason Tatom has a tremendous sonorous voice and he instinctively sets the precise tone and rhythm for all of his characters, including Prince Meinhard. While the cast extols all of the natural comedic opportunities in Bennett’s adaptation of ‘Rapunzel,’ they do perhaps their most impressive work with ‘The Juniper Tree,’ a story that dates 2,000 years ago and likely was put into its first formal written form by the Grimm Brothers. The story involves cannibalism as the mother tries to hide the killing of her son. This is no simple tale and, is highly unusual, in its original form, for how it represents the conflicting emotions of the stepmother, who tries to convince her beloved daughter that her brother’s death was actually her fault and meanwhile is suffering from remorse that is consuming her as well. Bennett follows the original story faithfully, as the boy is transformed into a beautiful singing bird. It is a chilling retelling done in a rapid, clipped form, with Evanoff’s underscoring completing the creepy effect, and it’s done in barely seven minutes. 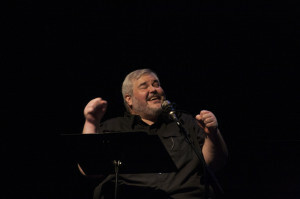 Actor Bill Allred in ‘Radio Hour Episode 9: Grimm.’ Photo: Rick Pollock. RadioWest host Doug Fabrizio in ‘Radio Hour Episode 9: Grimm.’ Photo: Rick Pollock. The family, now motherless, is complete. In fact, one realizes just what an image problem motherhood has in these three tales. Curious and coincidental perhaps but the notion of a nuclear family is just a recent sociopolitical invention that is, at best, an anomaly, not a time-tested tradition. Likewise, in ‘Little Snow White,’ the mother figure’s vindictive, evil nature rescues the original tale from its former abyss of pop culture treatment. Summoning Friedrich the Huntsman, the Witch-Queen demands that her eight-year-old daughter be killed and then eviscerated so that she can dine on her daughter’s internal organs. However, Friedrich spares Little Snow White and kills a baby boar: “Fooled by the huntsman, the Witch-Queen ate the animal’s lung sacks. 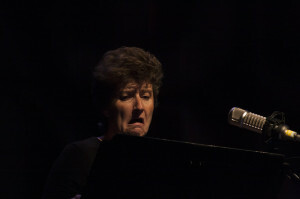 With a greasy chin, she imagined that the bolus in her throat was her daughter’s threefold beauty—the red, white, and black now macerated, liquefied, made into nothing by teeth and acid and bowels twitching.” Colleen Baum’s vocal tricks accomplish the effect for radio listeners in fine form. 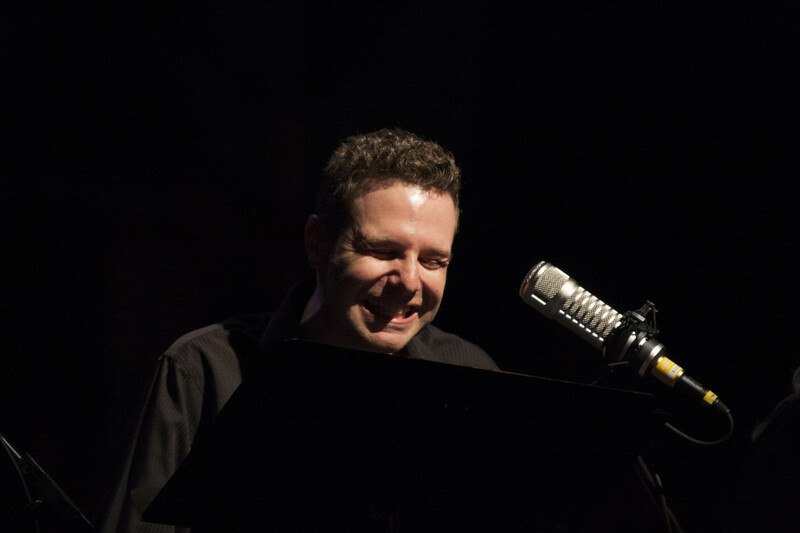 Musician and composer David Evanoff in ‘Radio Hour Episode 9: Grimm.’ Photo: Rick Pollock. The entire cast maneuvers effortlessly through the story’s 15 different character roles, mastering Bennett’s adaptation which serves up the original version of the tale in its proper dark glory. He takes reasonable liberties, poking playfully at the occasionally inanities of political correctness, especially with the seven ‘dwarves,’—er, ‘midgets’ or ‘little people,’ depending upon the capriciousness of the moment. The Grimm brothers did not give names to the septet but Bennett does, bestowing the group with the names of Russell, Rupert, Angus, Fergus, Leslie, Wesley and Trevor—who comprise the ‘Collective’ and have a fondness for heeding parliamentary rules of procedures. The Witch-Queen, of course, fails on all three attempts to kill ‘Little Snow White’: the asphyxiating tightening of the girl’s bodice, a deadly comb and, of course, the poisonous apple. The queen mother suffers her own fatal ignominy but, alas, the young heroine is revived not by the kiss of romance but instead by a forceful slap that expunges the chunk of poisoned fruit from her mouth. 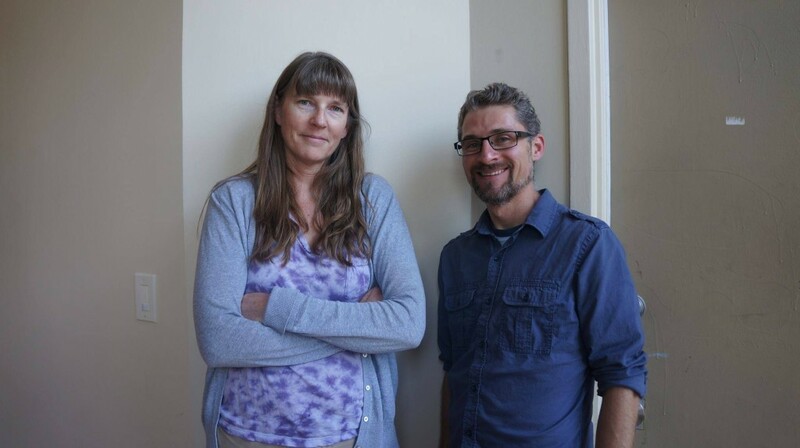 Director Cheryl Ann Cluff and playwright Matthew Ivan Bennett, ‘Radio Hour Episode 9: Grimm.’ Photo: Rick Pollock. The broadcast of ‘Grimm’ is available here, and RadioWest, hosted by Doug Fabrizio, has made available podcasts of the previous eight Radio Hour episodes available. 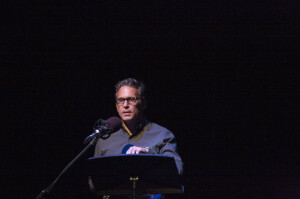 They are consistently excellent but this most recent episode may be the best representation of where Plan-B’s capacity for original, spell-binding theater sits now at the front of a much-anticipated season with seven world premieres by Utah playwrights slated. 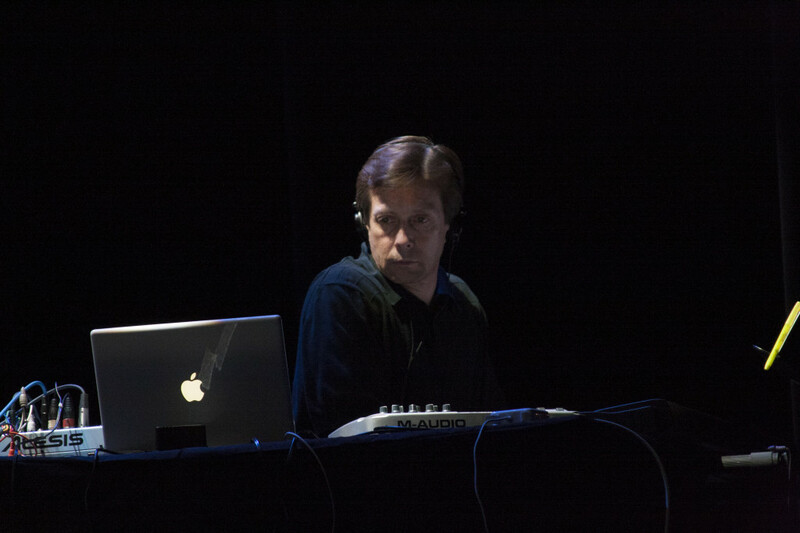 Cluff’s direction once again served up a masterpiece of minimalism, assisted by the efforts of Radio Hour production veterans Jennifer Freed as stage manager, Jesse Portillo as lighting designer and sound engineering by Eric Robinette. 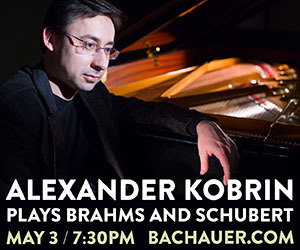 For more information about the company’s season, see here.